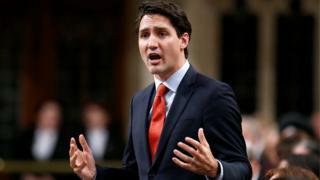 Canada's Prime Minister, Justin Trudeau, is under investigation over a holiday he took on the private island of billionaire philanthropist and spiritual leader Aga Khan. Mr Trudeau and his family were guests at the Aga Khan's home in the Bahamas at the new year. The federal ethics commissioner must now determine if the visit violated conflict of interest rules. Mr Trudeau has said he is "more than happy" to answer any questions. After a preliminary inquiry last week, Ethics Commissioner Mary Dawson said she would formally investigate whether Mr Trudeau had breached ethics laws. When news of his winter getaway was made public, Mr Trudeau went on the record about the vacation. He has also admitted using the private helicopter of the Aga Khan. Questions about the vacation have followed the prime minister, who is on a cross-country "listening" tour, hosting town halls and stopping into coffee shops to meet with Canadians. On Tuesday, he said he was working with the ethics commissioner on the investigation and that his staff were setting up a meeting with her office to answer questions about the Bahamas trip. Mr Trudeau has said that the stay over the new year was a "personal family vacation". He was accompanied on the trip by Liberal MP Seamus O'Reagan and Liberal Party President Anna Gainey, and their respective partners. Prince Karim Aga Khan is a close family friend of the Trudeaus and was an honorary pallbearer at the funeral of Mr Trudeau's father, Pierre. The Aga Khan Foundation has received hundreds of millions from the federal government over the past several decades, from both the Liberal and Conservative parties. Canadian conflict of interest laws prohibit ministers from accepting gifts, including free travel. If the commissioner finds Mr Trudeau broke the rules, he faces a fine of up to C$500 (US$380/£315) per penalty. No Canadian prime minister has yet been found in breach of a federal statute. But the fallout could hurt Mr Trudeau, who became popular with the voting public because of his accessible style, analysts say. Prince Karim Aga Khan is the 49th hereditary Imam of the Ismaili Muslims. They trace his lineage directly to the Prophet Muhammad. He is Swiss-born, lives in France, has a British passport, graduated from Harvard University and is among the top 15 of the world's wealthiest royals, according to Forbes magazine. It says he had an estimated wealth of $1bn (£640m) in 2008.